Concealers are not just for hiding blemishes and dark circles under the eyes; they can be used for lots of other things as well. So, is having only one concealer in your vanity enough? No! Presenting you 15 best concealer hacks that’ll leave you surprised, and will make your skin look flawless. Always apply your foundation first and then apply your concealer. Foundation will also give you some coverage, and hence you will need little amount of concealer to cover up. Using concealer and then foundation actually removes and spreads the concealer in an uneven manner. Drawing a half moon under your eye is the wrong way to apply a concealer. The right way is to make a triangle. This will make your cheeks look lifted and will also highlight the undereye area. If you do not want to spend money on expensive eyeshadow primers, then apply a concealer all over your lids. This will definitely work as good as an eye primer. Different shades of concealers have different usage. To hide a pimple, you need a green colored concealer. Apply, blend it and then apply a concealer that matches your skin tone. Blend it some more, and you’re good to go. If you do not have access to a green colored concealer, a matte green eyeshadow will work fine too. For hiding pimples on neck, chest or back, apply a concealer that exactly matches your skin tone. Now dab some translucent powder over it. The translucent powder will prevent the concealer from wearing off. If you don’t have any concealer, use your foundation. Place a small dot of foundation over your acne and do not touch it for 2 minutes. In these 2 minutes, the foundation will become little dry and its texture will become thicker. Blend it and you won’t be able to spot your acne. It’s important to use the right color at right places. A peach concealer works best for blue undereye circles, green is used to hide red blemishes, and yellow toned concealers are the master of all trades. 9) Puffy Eyes No More! If you want to get rid of puffy eyes instantly, before a big event, then all you need is an eye cream, a concealer and a highlighter. Mix all of these together and then apply under your eyes and over your brow bones. This tricks will brighten up the area and shoo away the puffiness. Does your concealer settle into the fine lines or look cakey after few hours of application? Dab a thin tissue paper over it. It will absorb all the excess oil. 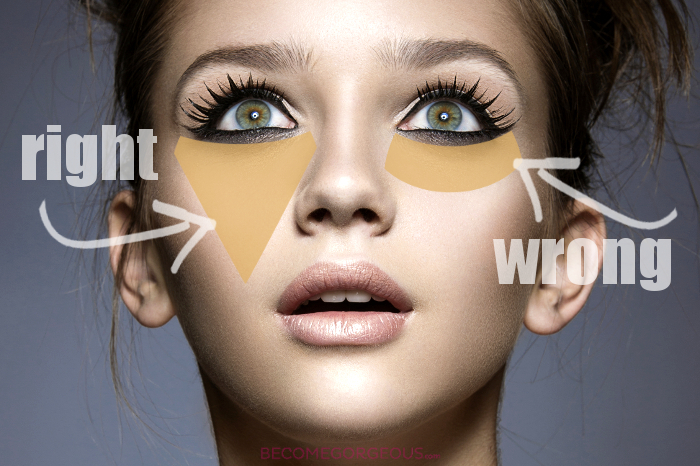 You can also correct minor eye liner mistakes with the help of a concealer. lipstick from bleeding, but also will make your lips appear fuller and more attractive. 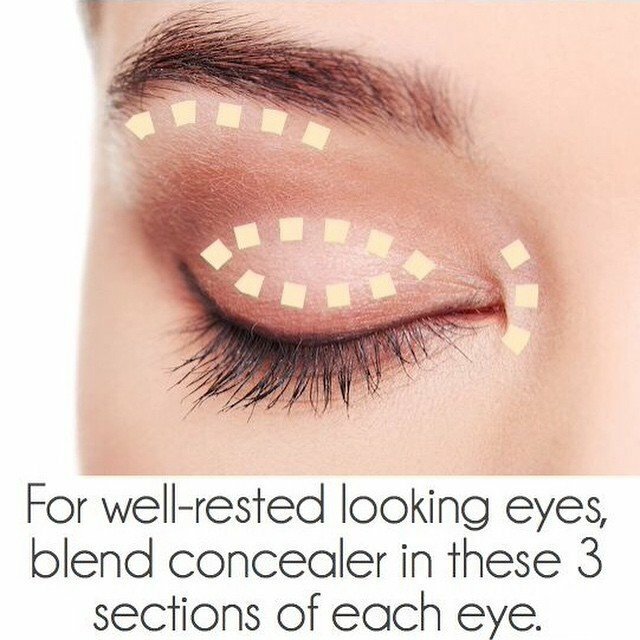 You may use concealers for contouring and highlighting as well. For contouring, you will need a concealer which is two shades darker, and for highlighting use a concealer that’s two shades lighter. Try to go for pencil concealers for this trick. 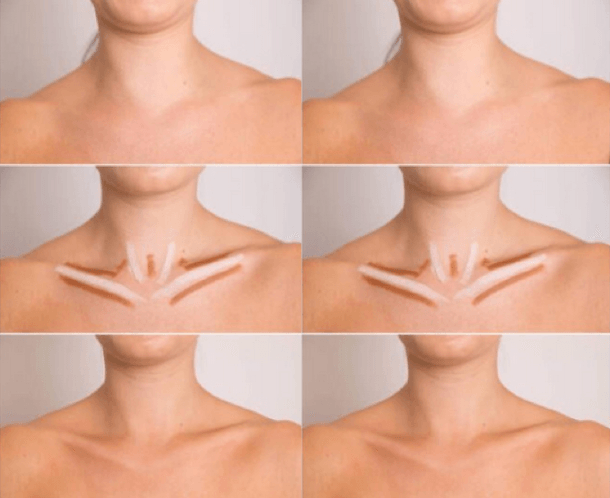 You can also intensify your collarbone with concealers by applying the contouring & highlighting method. Apply the lighter shade on the parts that protrude outward and then use the darker shade where shadow falls. Make your own tinted moisturizer by mixing your moisturizing cream and liquid concealer together.